I had the wonderful opportunity of teaching and preaching for my dear friend Dr. Mike Haynes. He has pastored for 30 years the TRIDENT BAPTIST CHURCH of Goose Creek, SC, just outside of Charleston, SC. I had the honor of traveling and preaching with Dr. Haynes for over one decade with Dr. Jack Hyles. Dr. and Mrs. Haynes were so kind to me. They took me out for a meal Saturday night and I thoroughly enjoyed the fellowship. When I arrived Dr. Haynes met me at the Charleston, SC, airport. He took me to the motel and I registered for my stay. On our way to my room on the elevator there was a couple already on the elevator. We greeted them and started up to the third floor. They were headed to the fourth floor. I began telling them I was from Texas and we laughed a little. I had an opening to give them the Gospel and they listened intently. As the door of the elevator opened to let us off on the third floor I asked them if I could pray for them. They said yes and I explained that the prayer does not save, but that Christ does the saving of the soul. They prayed and we rejoiced with them. I apologized for taking so much of their time. The man said, “No, this is the best thing that could have happened.” They thanked me and we exited. While they were praying I thought I heard someone in the hallway talking. 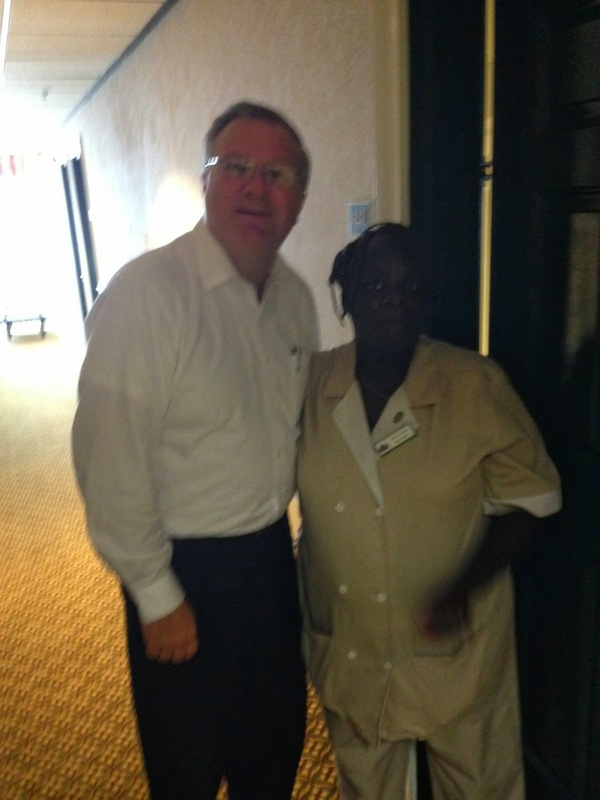 We stepped off the elevator and there was a dear lady standing alone in the hallway. I thought to myself I wonder who she was talking too. Then I asked her, “Did you pray with us?” She answered, “Yes I did!” So, we rejoiced with her. This same young convert came to my room on Sunday afternoon between services and knocked on my door. I opened the door and she introduced to me a friend of hers. She asked if would pray with her also. I did and she did! AMEN! I went back to rest my back and I heard a knock at the door again. I got up and went to the door. It was the two who who trusted Christ on the elevator the day before and they wanted to thank me for talking to them and praying with them. That’s a first. I went back to rest some more. I have 3 herniated discs – L3, L4, and L5. I lay there for about 15 minutes and once again I heard a knock at the door. I got up again and went to the door and a lady said I was told there was a man of God who would pray with people. WOW! I gave her the Gospel and she prayed and invited Christ to be her personal Saviour. Well SOMEBODY SAY AMEN! Sunday morning I taught my Sunday school lesson on “FORGIVENESS” and I preached my sermon “I HAVE FALLEN AND I CAN GET BACK UP.” God gave us 10 precious souls and 2 adults followed the LORD in baptism. On Sunday night I preached “FANTASY VS. REALITY.” What a wonderful spirit these dear people of God demonstrated on this Lord’s Day. All of the books on our book table were sold and the people were very kind to this preacher. I always enjoy being with my dear friends the Haynes family.